A hush fell over the room as the watchmaker halted his work. 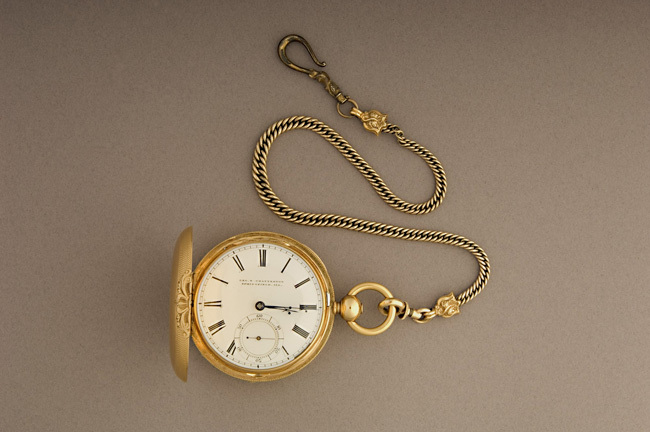 A partially-dismantled pocket watch that once belonged to President Abraham Lincoln gleamed in his hands. He looked up from his task and pushed a visor, fitted with magnifying glasses for detailed work, up onto the top of his head. “The moment of truth has come!” he boomed. I waited, perched on the edge of my seat, for a verdict—was there really a secret message inscribed inside the watch? And if so, what did it say? Lincoln himself never knew of the message he carried in his pocket. In fact, museum curators had been unaware of the possibility of any such inscription until Doug Stiles, great-great-grandson of watchmaker Jonathan Dillon, phoned to corroborate a story that had been passed down for generations in the Dillon family. Here’s how the story went: Jonathan Dillon was working for M.W. Galt and Co. in 1861 when the owner of the shop announced that the first shot of the Civil War had been fired at Fort Sumter. In an interview with the New York Times, published on April 30, 1906, Dillon recalled that the news inspired him to unscrew the dial of President Lincoln’s watch, which he had been busy repairing, and with a sharp instrument he wrote on the metal beneath: “The first gun is fired. Slavery is dead. Thank God we have a President who at least will try.” To his knowledge, Dillon told the Times, no one else had ever seen the inscription. 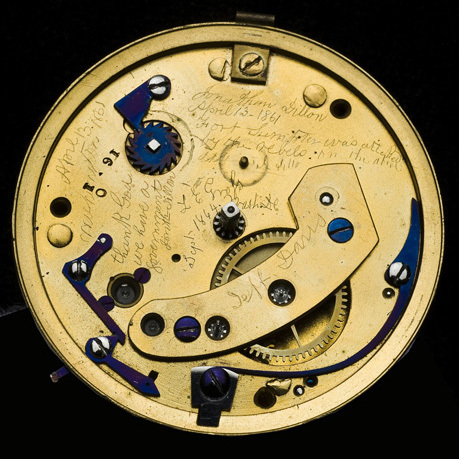 When Stiles contacted curator Harry Rubenstein about the tale, the museum agreed to remove the watch dial to see if it was true. Museum volunteer and master watchmaker George Thomas did the honors of disassembling the watch. His passion for working with mechanical time pieces shone as he described the details of the watch: an 18k gold case inscribed with the initials of the casemaker is clearly American-made, while the movement was made in Liverpool, England. He delighted at the mint condition of the watch, which is fitted with original hands and shows no cracks in the dial. As he carefully removed the pins holding the watch together, he described the process for the group of museum staffers, reporters, and members of the Dillon family that were gathered together. Taking care not to scratch the case, he carefully removed the tiny hands. He paused before removing the face. The room was hushed with anticipation. As curator Carlene Stephens later explained to me, it was a nerve-wracking process: any time you take a fragile piece of machinery apart—especially one that is nearly 150 years old—you face a number of unknowns. The item could be oxidized or gummed up with ancient whale oil. But the museum had a highly-skilled watchman at the helm—equipped with the right tools and the patience to responsibly handle such a precious artifact—and just a little luck. George Thomas deftly lifted the watch face and peeked inside. He was about to help solve a centuries-old mystery. A smile lit up his face and there was an audible gasp from the room as he motioned for the watchmaker’s great-great-grandsons to come up and read the inscription inside the timepiece aloud. Doug Stiles, visibly moved by the revelation, borrowed Mr. Thomas’s magnifying glasses and took a moment to inspect the inner workings of the watch. After an expectant pause, he gleefully shared the message with the rest of the room: “Jonathan Dillon April 13, 1861 Fort Sumpter [sic] was attacked by the rebels on the above date J Dillon April 13, 1861 Washington” and “thank God we have a government Jonth Dillon.” So the actual phrasing is quite different from Jonathan Dillon’s own recollections cited in the New York Times piece a century ago. But solving this fascinating history mystery delights us still. With the inscription revealed, museum photographers worked to capture close-ups of the object while Stiles reflected on the significance of his great-great-grandfather’s creative expression. “My ancestor put graffiti on Lincoln’s watch!” he quipped. Watchmaker Jonathan Dillon wanted to record something for posterity, to be a part of history in the making. His reaction to the firing on Fort Sumter adds a fascinating layer to our historical knowledge about the watch in our collection. More than that, Dillon’s secret message—now revealed—is a reminder of the many rich histories so many of us keep in our families, connecting us in a deep and personal sense with the strange inner workings of the past.